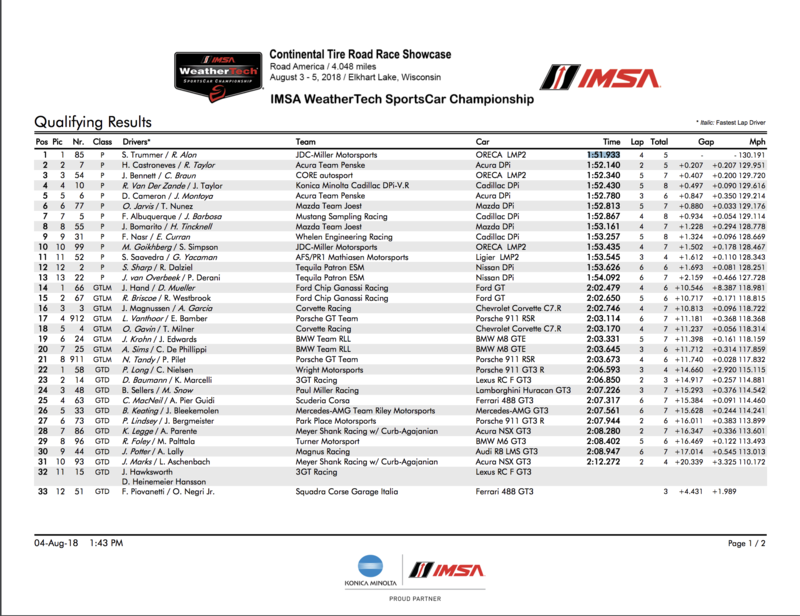 Also featured: GT Le Mans and GT Daytona qualifying results. 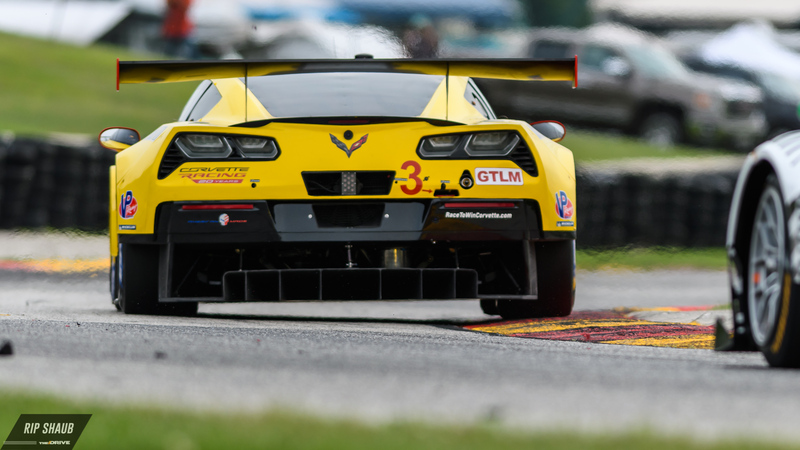 Saturday's IMSA WeatherTech qualifying round for this weekend's sprint event at Road America was led by the impressive pace of Robert Alon in the JDC Miller Motorsports Oreca, earning the team its first pole of the 2018 season. Robert Alon bested the No. 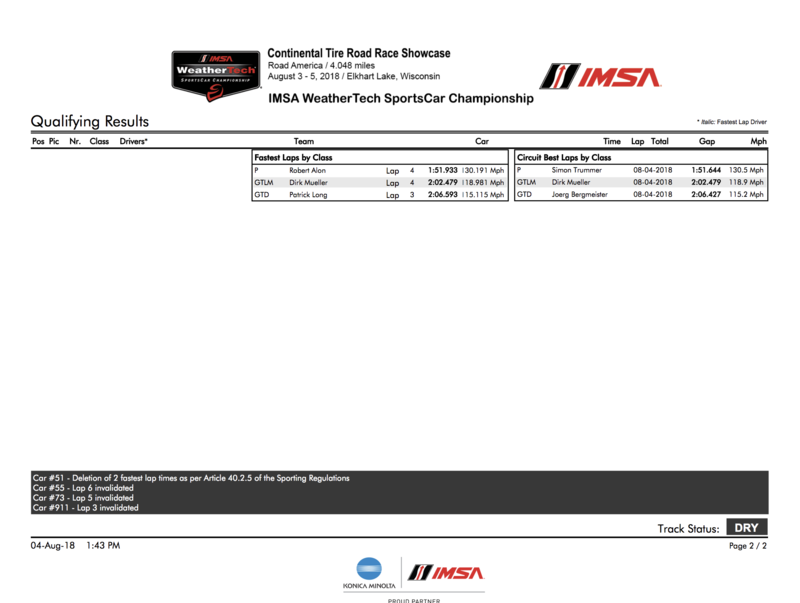 7 Team Penske Acura of Ricky Taylor, becoming the only car to dip into the 1 minute, 51-second range. His JDC Miller Motorsports Oreca 07 Gibson paced the field of Daytona Prototype internationals and fellow global-spec prototypes, placing an LMP2 racer on pole for the third consecutive race. Leading the second row is Colin Braun's No. 54 CORE Autosport Oreca. He'll be accompanied by Wayne Taylor Racing's No. 10 Cadillac DPi-V.R driven by Jordan Taylor and Renger Van Der Zande. A slew of DPi cars fills out seven of the top 10 spots on the Prototype grid, leaving Tequila Patron ESM at the bottom as the team continues to struggle after its No. 22 entry caught on fire during FP1 on Friday. CGR's No. 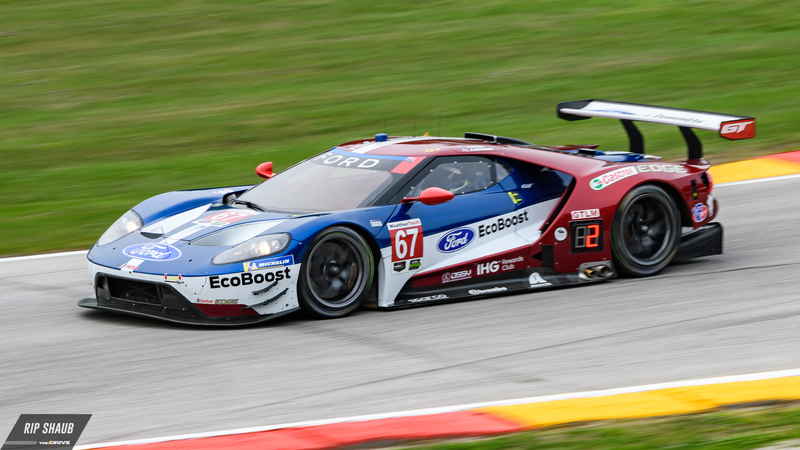 66 Ford GT entry has been historically successful at the Elkhart Lake, Wisconsin track and it upheld its reputation with Dirk Mueller behind the wheel Saturday afternoon. 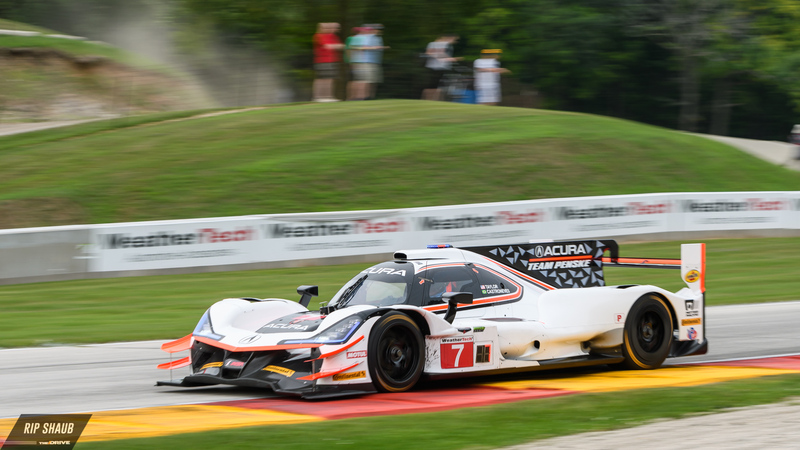 A time of 2:02.479 around the 14-turn course put the German ahead of the field for the third consecutive year, reinforcing the crew's dominance at Road America. Mueller and teammate Joey Hand will start ahead of the second Ganassi Ford of Ryan Briscoe and Richard Westbrook while the No. 3 Corvette Racing C7.R qualified third with a time of 2:02.746. The best-placing Porsche nabbed P4 at the hands of Laurens Vanthoor, nearly half of a second off the pole-winning pace. The Stuttgart team was quickly followed by the No. 4 Corvette whose 2:03.170 was enough to put them in the final spot of the top-five. BMW Team RLL struggled on Saturday, qualifying nearly a second off of its best times yesterday with the Nos. 24 and 25 finishing sixth and seventh respectively. The No. 911 Porsche fell to the bottom of the field as Nick Tandy and Patrick Pilet will start from the back. Longtime Porsche factory driver Patrick Long put his No. 58 Wright Motorsport 911 GT3 R on pole for the first time of the season with a 2:06.593 fastest lap. He and Christina Nielsen will head up the GTD field with pressure from the rolling No. 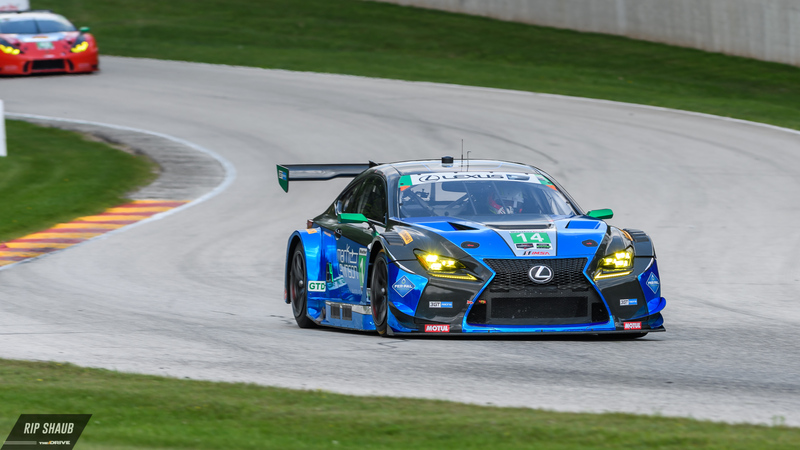 14 Lexus RC F GT3 and championship-leader Madison Snow in the No. 48 Paul Miller Racing Lamborghini Huracan. Cooper Macneil in the Scuderia Corsa Ferrari 488 GT3 rounds out the second row, performing a 2:07.317 lap around the 4.048-mile road course. Recovering from a massive crash in Free Practice 1, Ben Keating ran fifth fastest in qualifying with his No. 33 Mercedes-AMG GT3. 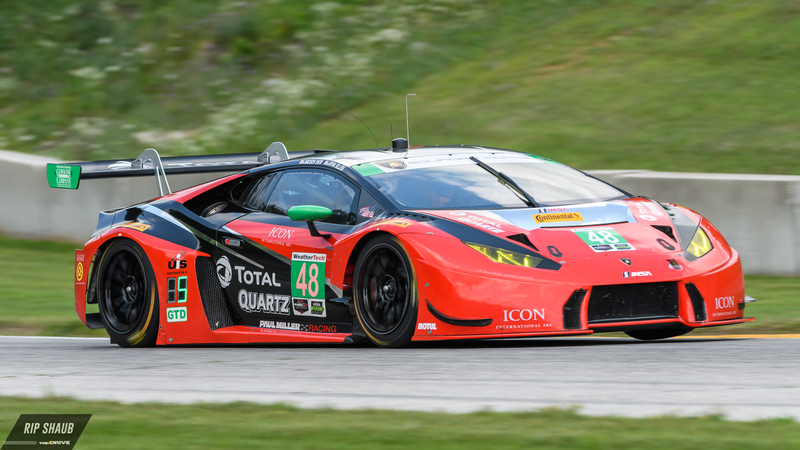 The team resorted to using its spare chassis on Saturday and was able to piece together a car that placed it within the top half of the GTD field. 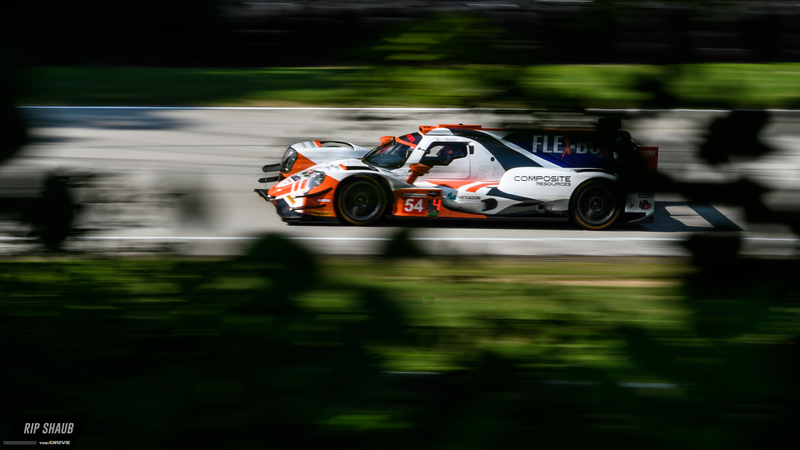 The series heads to the beautiful sweeping landscape of Elkhart Lake, Wisconsin for the ninth round of the WeatherTech Championship season.